QuickBooks is the leading business accounting software platform for a reason. It’s easy-to-use, simple to learn, and compatible with a wide range of devices, platforms, and other software. If you use QuickBooks to manage your shop’s accounting process, you have plenty of company. As great as QuickBooks is, though, it can’t do everything your shop needs. QuickBooks is accounting software; it’s not manufacturing software. There are many shop operational functions that can’t be performed by QuickBooks. It’s a powerful accounting tool, but it’s probably not robust enough to run your entire shop. That’s why we designed our shop software, E2, to integrate seamlessly with QuickBooks. 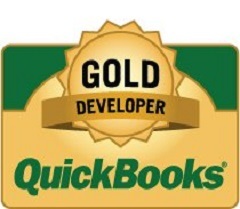 In fact, we’re a Certified Gold Developer with QuickBooks. That means our software has undergone extensive testing and a rigorous approval process by the QuickBooks team. The Gold Developer certification shows that E2 passed the process with flying colors. Why would you need E2 if you already have QuickBooks? We hear that question all the time. Many shop owners and managers assume that E2 is another accounting program and that it simply duplicates the functions of QuickBooks. You can use E2 to quickly generate accurate quotes and estimates based on your costs for past jobs. E2 can then immediately convert that quote into an order, send a materials order to the appropriate vendor, schedule the job on your floor, and even set up the shipping schedule. In short, E2 helps you manage the entire flow and process of your shop’s operations with just a few clicks. You get full transparency into your shop, and you have all of the information you need to make good decisions. How much time does each job take? What’s the best way to route jobs through your floor? Where are jobs in your process? How much should you really be charging for each piece of work? Should you hire more employees or invest in a new machine? These are the questions E2 helps you answer. QuickBooks helps you manage the money. E2 helps you manage the shop so you can make more money. Your question may be how much more work and data entry will be added if you use both QuickBooks and E2 together. The answer is simple. None. The two software platforms are fully integrated. E2 was developed to work seamlessly with QuickBooks. When information is entered into E2, it immediately and automatically updates in QuickBooks. There’s no need for duplicate entries or additional data work. Even better, we’ll help you get the systems up and running. When you install E2, our installation team will help you integrate it with your current QuickBooks platform. If you have any integration problems in the future, our team is here to help you resolve the issue. E2 and QuickBooks aren’t alternatives to each other. Rather, they’re partners. Use them in conjunction to create complete transparency into your shop and your books. Contact us today to learn how you can integrate E2 with your QuickBooks software. We welcome the opportunity to help you take back control of your shop.